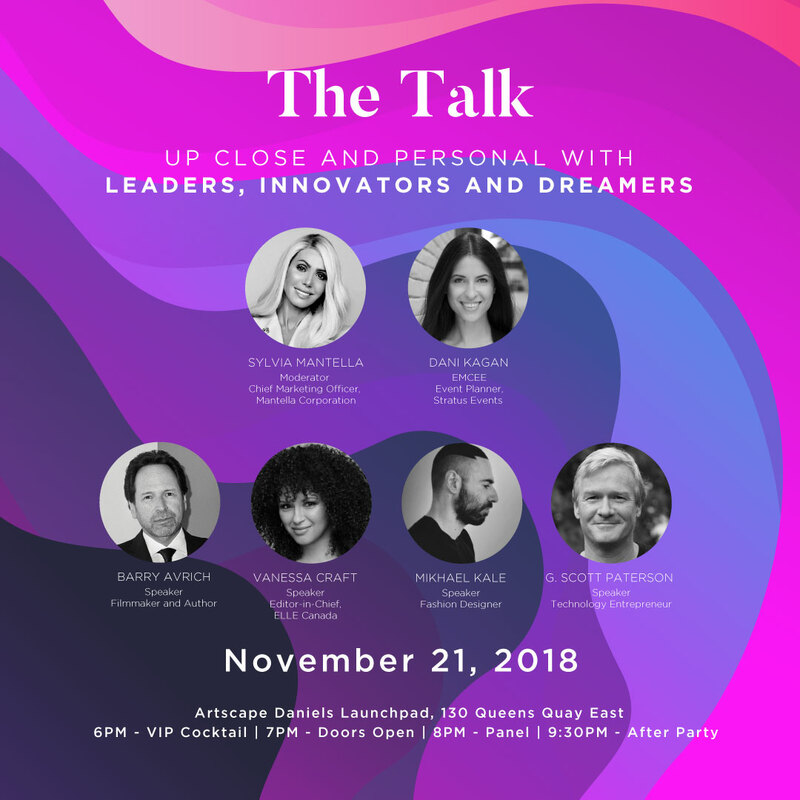 On Wednesday, November 21, 2018, five of the country’s most brilliant and innovative minds will come together in support of UforChange with “The Talk” – a live panel discussion with producer/director and advertising executive Barry Avrich, ELLE Canada Editor-in-Chief Vanessa Craft, fashion designer Mikhael Kale, and technology entrepreneur G. Scott Paterson; moderated by philanthropist and Mantella Corporation’s Chief Marketing Officer Sylvia Mantella and emceed by Dani Kagan of Stratus Events. The event is set to take place at Artscape Daniels Launchpad at 130 Queens Quay East in Toronto. VIP guests will enjoy an extended two-hour cocktail reception starting at 6pm to meet with the esteemed panelists, moderator, and UforChange alum. All guests will enjoy a one-hour cocktail reception starting at 7pm sponsored by Umberto Cesari iOVE wine, Barista Coffee Liqueur, and Lost Craft beer prior to the one-hour panel discussion starting at 8pm, followed by an after-party for all the guests to enjoy. The Talk’s provocative panel will uncover how these creative leaders paved their unique path in their respective industries through unforgettable and inspirational stories of struggle and triumph. The event will bring together a diverse audience of Toronto’s most influential creators and business leaders with emerging artists and youth to be inspired by one another. Proceeds from ticket sales and donations will help fuel the next generation of young creatives by allowing youth to obtain an arts education during the next program cycle at UforChange. Tickets available for purchase by clicking here.